The Bohr Effect refers to the observation that increases in the carbon dioxide partial pressure of blood or decreases in blood pH result in a lower affinity of hemoglobin for oxygen. This manifests as a right-ward shift in the Oxygen-Hemoglobin Dissociation Curve described in Oxygen Transport and yields enhanced unloading of oxygen by hemoglobin. Decreases in blood pH, meaning increased H+ concentration, are likely the direct cause of lower hemoglobin affinity for oxygen. Specifically, the association of H+ ions with the amino acids of hemoglobin appear to reduce hemoglobin's affinity for oxygen. Because changes in the carbon dioxide partial pressure can modify blood pH, increased partial pressures of carbon dioxide can also result in right-ward shifts of the oxygen-hemoglobin dissociation curve. The relationship between carbon dioxide partial pressure and blood pH is mediated by carbonic anhydrase which converts gaseous carbon dioxide to carbonic acid that in turn releases a free hydrogen ion, thus reducing the local pH of blood. The Bohr Effect allows for enhanced unloading of oxygen in metabolically active peripheral tissues such as exercising skeletal muscle. Increased skeletal muscle activity results in localized increases in the partial pressure of carbon dioxide which in turn reduces the local blood pH. Because of the Bohr Effect, this results in enhanced unloading of bound oxygen by hemoglobin passing through the metabolically active tissue and thus improves oxygen delivery. Importantly, the Bohr Effect enhances oxygen delivery proportionally to the metabolic activity of the tissue. As more metabolism takes place, the carbon dioxide partial pressure increases thus causing larger reductions in local pH and in turn allowing for greater oxygen unloading. This is especially true in exercising skeletal muscles which may also release lactic acid that further reduces local blood pH and thus enhances the Bohr Effect. A variety of environmental factors can shift the Oxygen-Hemoglobin Dissociation Curve. Effects which are associated with increased peripheral tissue metabolism, such as reduced pH, increased CO2, increased temperature, shift the curve to the right, reducing hemoglobin�s affinity for oxygen and thus improving oxygen unloading. Chronic hypoxia increases the blood�s concentration of 2,3-DPG which also shifts the curve to the right. 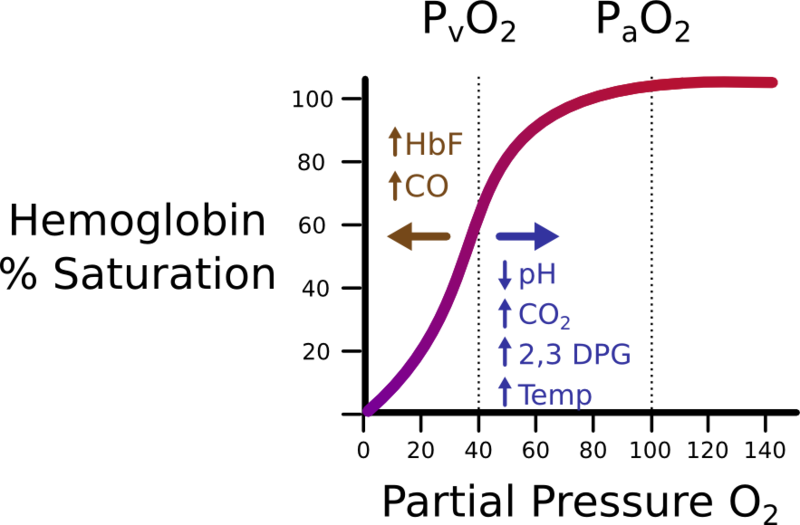 The presence of HbF and carbon monoxide (CO) shift the curve to the left, increasing the oxygen affinity of hemoglobin.